At least by FINA standards. With the water temperature dropping below the FINA mandatory wetsuit level of 18°C (64.4°F), the fastest professional open water swimmers donned on black neoprene wear and took to the coolish water off the Portuguese coast. Wetsuit or no wetsuit, Haley Anderson is on a roll. Flying from her home base at USC in Los Angeles, she first traveled to France and won both the 10 km LEN Open Water Cup in Gravelines and followed that up with a victorious 5 km mixed team relay at the French National Open Water Swimming Championships. Staying in Europe to train, the American earned another podium win on the 6-loop FINA/HOSA Marathon Swim World Series course in Setúbal Bay. Setúbal Bay seems to suit the 2012 Olympic silver medalist very well. Six years ago to the day, the American qualified for the 2012 London Olympics by winning the Olympic qualification race. The times of the top women - usually about 7 minutes slower than the men on average on a 10 km course - were 10 minutes behind the men this time. "It was a really hard race because currents were really tough," explained Anderson who beat Sharon van Rouwendaal by just over a second. "When you are leading at the end, you just try to hold on. I know that she is really fast, but I am happy for the way I finished the race." Van Rouwendaal said afterwards, "When I realized that she was in front [by] fifteen meters, I tried to close the gap, but she had more speed and it was impossible to catch her. She had more energy at the end, I think. I am very happy to get the podium. I tried to win, but I was really tired at the end." 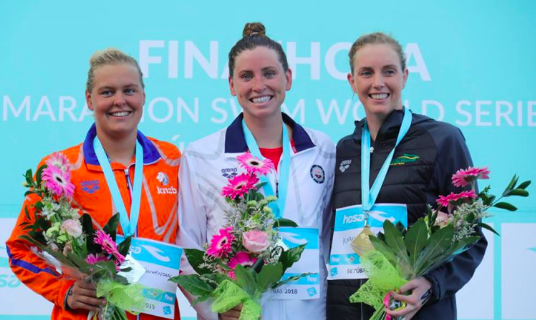 Australian Kareena Lee finished for the first time on the podium at a FINA/HOSA Marathon Swim World Series race, "It is amazing being third, it is the highest for me in a World Series event." In a week, the competitors will meet again at the next FINA/HOSA Marathon Swim World Series race in Balatonfüred, Hungary on June 16th. Men's race is described here.